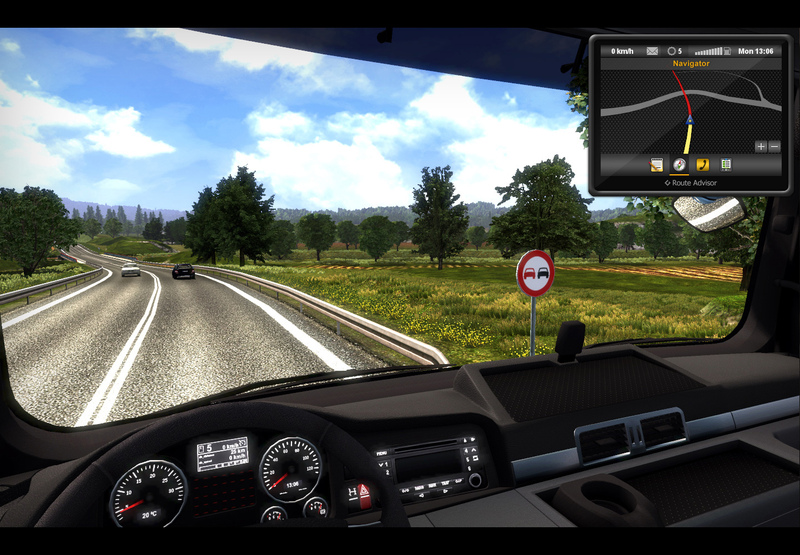 One of cool new features of Euro Truck Simulator 2 is the Route Advisor. It is a combination of a navigation unit, scheduling device, diagnostics and communication module. Rather than using abstract user interface elements, we are trying to produce a believable "gadget" - a smart box that every truck driver would love to have with him or her on the road in our ETS2 world. Route Advisor is not dissimilar to existing devices used by the transportation industry these days. In reality, the Big Brother aspects of these little boxes is not something that truckers would be so excited about. Nice! Hmmm... i think it's possible like in Test Drive Unlimited, the GPS is in the place of GPS in the dashboard. Other informations will be okay in the "Route Advisor" Good Job SCS! The route advisor seems to be usefull for the game (time remaining, next stop). Making a game is something very difficult. Because I'm a truck and bus/coach lover, I like SCS software since many years. The only suggestion i would do, is to improve (if possible) the extern camera with a zoom in/out (through mouse wheel button). This would be perfect to better see all your work :! beautifull truck but also beautifull country. Perhaps a free walk around (like a pedestrian) would be cool (but more difficult to implement, I think). But the most important is : for all your games, thank you. I wish you success ! I keep being impressed about all the little things you add to the game, when, in fact, they may not be *that* necessary to boost sales. Yet, you still do it. Great work, I hope the AI Taking over programming is going well, too! Novos dispositivos! Agora é ainda melhor, em comparação com edições anteriores, foi bastante simples, como esta versão é digital agora, finalmente. Este jogo está cada vez mais inovando com a tecnologia, a jogabilidade é que pequenos detalhes, eles viram os detalhes grandes e bons, e eu sei que há mais por vir ainda. E o interior do DAF foi muito boa. This looks promising.I like both the GPS and rest of the infos.It would be even better if you could put navigation physic in truck,on the dashboard.But this is great too. I see you are doing a hard work on this game so I want to thank you SCS for making a one great game. Everything published since the introduction of the ETS Mods ETS2 2 in Turkish for the Turkish people shared care. it is possible that the "Route Advisor" is displayed in the dashboard? very nice SCS, I like this Route Advisor, and please for the next news can you give us an idea to explain how the radars will function in the game and if this "Route Advisor" will localize them when we pass for the first time near them. thanks dear SCS. Wow this is great! This will really help when I want to check my route, or how much gas I have left, or where the next stop is, or how much time I have left to deliver. Keep up the great work! I'll definitely be getting ETS2 when it comes out! It should be an GPS system on the board not in air or ... hows that. Whatever is a great improvement to the game, somehow. Wow looks awesome and I see we will have timed runs! Witch is good, adds to realism! I just hope that we can trash around on some loads every now and then. Looks splendid. Keep up the outstanding work SCS Software team. 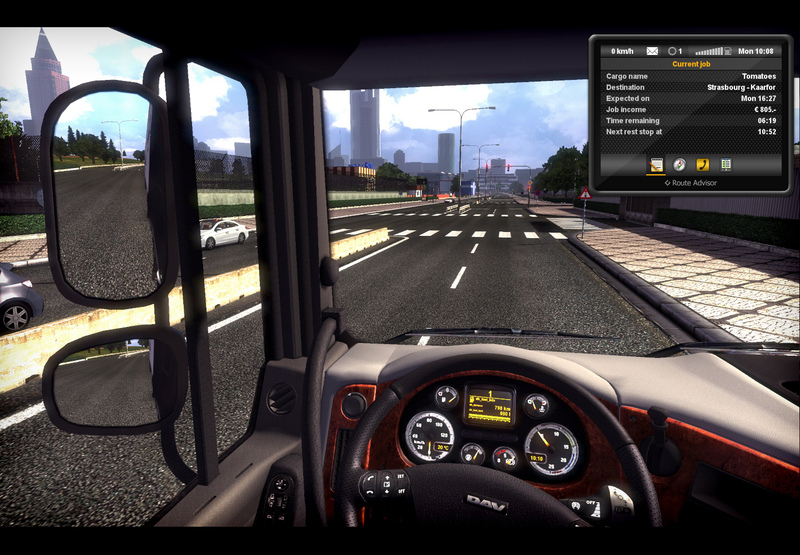 maybe add it like it is attached to the dashboard and if you want some hardening disable the GUI of it and use the one on dashboard when driving inside the cab. What anonymous posted and mikEWronaPL also linked too would be great, especially with TrackIR (and perhaps a hotkey to temporarily bring it up on screen for those who want it). All in all, another step towards realism, well done, SCS. Keep it up! Why did you decide to put the level of gasoline, the number of gearbox, speedometer in that computer? how to use it while driving? Looks great! Would it be possible to integrate it into the truck like a real navi so that this system doesn't look like a pop-up? 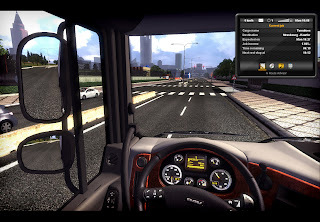 For now, you guy's are doing a great job, this will be the best truck simulator ever!!! OUTSTANDING ! The route adviser/sat nav is a very welcome addition to the game.Would you have to buy it in customisation or will it come as standard? Also I'm LOVING in the second picture that you have zoomed back the camera to include the door mirror ( In earlier blogs the view was zoomed in and not to my taste). This is the best driving view in my opinion. Will this be the standard view or adjustable by user? Please I want to see new ports that have traffic, gas stations and new countries and cities on the map...and much more!!! Greate job! Wow. Some months ago, when I first heard about navigation in ETS2, I din't expected it should look/act as almost real GPS navigation or even with combination of some smartphone functions... Now everything looks more realistic. E-mails, trip info, map - everything in one device, which could exist in real world, instead of using HUD. Just great job! does the GPS Navigator has audio support? but I'm a bit disapointed, Frankfurt looks exact like Frankfurt in GTS can't find any changes! But wouldn't it be a good idea to integrate it into the dash? Or another possiblility is to mount it on the dash ofcourse. That would add a bit more realism to it, but that's just my 2 cents. Good luck with the further development of this jewel of a game. The next update, on the weather map or get a video with the weather conditions, please. Alfist-GTV6: Hmm... I think if this gadget would integrated into dash, letters would be really too small for everybody who doesn't have 27" screen. :-D And map wouldn't be useful. This solution is probably best compromise between reality and user friendly gameplay. Integrated gadget would be as duplicate of window's and letters can be read in the traditional way...so it is possible. Finally GPS and I like the Information Display too! Hope that DAF is getting a radio finally... That center console looks poor. avez-vous une idée pour la sortie du jeu en France et en Français? It would be really nice to see atleast the navigation map integrated into the dashboard. When I played ETS and some modded interiors had those screens on the dashboard with still images of maps, I always wished it would actually work. It would be so easy and feel more realistic, if you could just take a quick look at the dash screen and know your next turn. But anyways, whatever you do, I thank you for it. You are by far the most dedicated game developer I've ever seen. I'm sorry you don't get back as much you give to others. ^ "I'm sorry you don't get back as much you give to others." magnifique , rien dire ! I agree with yannick who said that the camera should be zoomable. Please implement that feature. The work you've done sofar is fabulous!!! no more frustrating navigation via maps. Why "DAV" ? I know it's "DAF". great but is there police cars in the game? Awesome SCS. Would also be nice if Route Advisor would be in dashboard!!! That would be great! please guys,,..it's been taking so long - let us know at least if January 2012 can be confirmed..wrap down the stuff it's high time for the game!! it's been 3 years since Euro Truck 1 ! Hey SCS! on the start I have to say, total awesome job you are doing. I am really admiring the things you do for ETS2 - but I incline to the fact that it's high time for you to release it - or at least to kill off the suspense and let people know the exact release date. I think most of us are worrying that you are going to carry and carry the work into 2012 and the game will never come out! Greetings. cool cool cool route advisor, I like it, very useful! MORE WORK ON TRUCKS INTERIOR PLEASE ! That´s intresting scs, good idea. Route Advisor seems like a very nice idea! Much more realistic approach than just UI elements. Release date of ETS 2 ? I heard maybe it will be in 2012 ? I hope they take the time they need in order to get as much new stuff implemented as possible. Hey, this would look well better if it had its own place on the dashboard! what about cb-radio and arial? Wow, its so beatuiful. Good job SCS! these are a few of the things that would make the game much better. keep up the good work scs. it is clear for me, I will play ETS2 day and night.. Very good "gadget" with nice functions! Hello what is actually needed for a graphics card and what a Ram? Would be game versions in Portuguese (Brasil) ? And how it should be the ideal computer to Euro Truck Simulator ? About the GPS, it's very good, but it could have the option to appear at the bottom of the screen also. It disrupts in maneuvering and even in traffic increasing the truck's blind spots. caption for trailers? can we change the color? can the driver (player)have his own trailer if he want? OK, so anyone knows for sure when they'll release it? We really want to BUY it! Keep everything at realistic level then it will be ok.
mapview that we can see the routes across europe, motorways and single roads. borders and resting places. On polish ways please make holes in the road, because in Poland are bumpy roads. Thats intresting to drive. 5 days without an update. Come on!! WE WANT AN UPDATE !!! At least every other day please. C'mon I say same, UPDATE! We want more NEWS ! Give a little time to SCS Soft work. SCS are working, not playing around on the web in their chairs, give them the time they need to make things happen there! We'll have to wait for 2012 anyways, so just relax people! oh yes I´m waiting for news 2.
hope today will be come some new images or video. I think we'll have news tomorrow. The people who are actually going to get this game want to be surprised. This route advisor is amazing! I always wanted it, but I never believed SCS would actually do it! It looka great, and makes me so anxious to play the game. And I agree with anonymous above. The people who are going to buy this game, like me, DO want to be suprised. Posting once a week or every two weeks is fine with me. But do post though. Don't leave us in the dark. "We are still not sure when the game will come out. Definitely not in 2011 though." I think some big news is incoming , maybe the DATE OF START!!!! The ETS2 world will be very intresting! why, no update ? few days...? Chill guys, we won't have an update today. Maybe we'll have tomorrow. Will this game be available at OnLive? Hello, I'm a fan of their games, I have them all. I would suggest you post some scenes showing how the weather will be in two ETs. Fog, rain, snow, mud, etc.. I also wonder if there will be pedestrians, animals, or life in Ets 2.